The Hideaway is just that! You can hide it just about anywhere on your vehicle because it’s only 1” in diameter and made of strong aluminum and shatterproof polycarbonate, but...WOW!...is it a POWERFUL 27 watts! It’s a hurts-your-eyes BRIGHT even in our product video because of its 9 Generation IV 3-watt LEDs that flash much faster than normal. It comes in 5 solids colors of your choice with 19 flash patterns and pattern memory. It can be synchronized with as many as 19 other units, and it’s totally waterproof. Included is a mounting flange and rubber gasket to seal it tight. It comes with your choice of chrome or black mounting frames so it will match the background surface. An in-line flasher is attached to the 15’ power cord that is hardwired into an existing emergency light or siren unit. If you want an intense light that’s out of sight until YOU turn it on….the Hideaway 9 is it! The Hideaway, virtually undetectable and completely concealed, will turn the head and tail lights or the reverse markers of your emergency vehicle into high-powered, eye-squinting strobe. It’s best if an EVT professional installs it, but if you do, be sure to check out the Installation Guide in Knowledge Base on our website before installing, and remember to always read through all the directions completely before you start. If you run into ‘a snag’ just contact us at Extreme Tactical Dynamics. We are always ready to help you out! Most Hideaways do not have 9 LED's this one does and man is it bright. They also have a flange mount and they look great under the side mirrors giving 360 warning there. Just finished installing these strobe lights on my GL1800 Goldwing motorcycle. I installed amber ones inside amber lens turn signals. I am very pleased with brightness during the daytime. I will be ordering more lights in the future. Great lights overall. Easy to install. I put these in flush mount fixtures in tailgate of SUV with clear lens. Extremely bright. I would recommend these to anyone wanting small easily installed strobes. 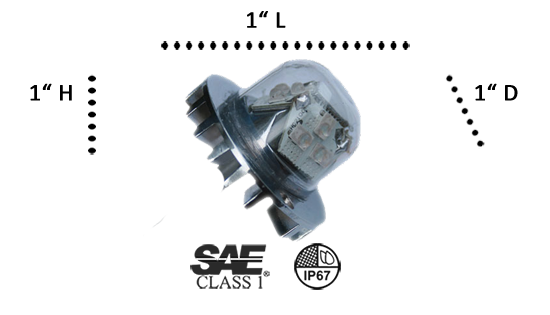 They out perform older xenon strobes. Colors are great. Selectable flash pattern & synchronization with other lights works great. Overall Great LEDS! Very bright for the color. These leds are brighter than the whelen brand and can be see perfectly during the daytime. Very fast shipping as well! I recommend these LEDS for all law enforcement vehicles. Great price too! best strobes i have found in led. i ordered 4 sets and put two in my reverse lights and two in my fog lights. these are in my opinion the best led strobes you are going to buy. very easy to install and great flash patterns. If you are looking for top of the line hide-away strobes, i would reccomend the LED hide-away 9. These little strobes are attention grabbers and are super bright. Thank you ETD, for helping me equip my car with my first responder needs.